Off the back of TIFF and the Palm Springs International Film Festival, we are pleased to inform you that Jirga is being released in cinemas across the USA this June, 2019. Jirga is also Australian submission to the Oscars Foreign Language Academy Awards and winner of the coveted CineFestOz Best Film award in 2018 and also won Best Independent Film at the AACTA Awards, Australia’s equivalent of the Oscars. 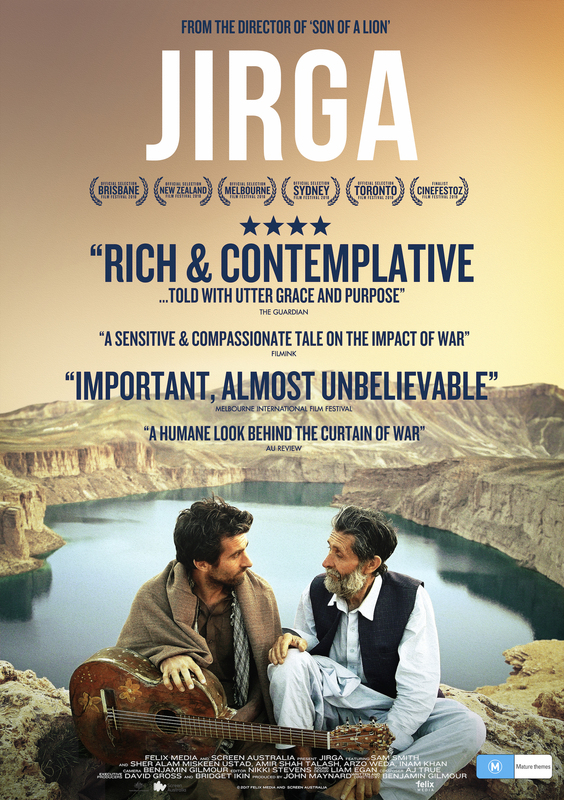 Event Cinemas are releasing Jirga on January 31st at Sydney (George St; Macquarie; Mt Gravatt), Adelaide (Marion), Canberra (Manuka), Perth (Inaloo). Jirga is currently screening around Australia after launching at Sydney and Melbourne Film Festivals and being the only Australian film in the SFF Official Competition. The film is also available for community screenings. You too can become a peace activist by arranging a screening of Jirga in your community. It’s easy! Please write to us and we’ll send you all the information or visit FanForce for details. Three years after an Australian army helicopter raid on a small village led to the killing of an unarmed man, former Australian soldier Mike (Sam Smith) returns to Afghanistan to find the victim’s family. Doggedly, he sets off on a perilous journey over a terrain where both the Taliban and ISIS are active. Mike is determined to make amends and so puts his life in the hands of the Jirga – the village justice system. The risky trek has remarkable parallels with the making of the film. With an earlier version of the screenplay in hand, director Benjamin Gilmour and actor Sam Smith headed to Pakistan to shoot a film on the border with Afghanistan. When the script was deemed too politically sensitive, the promised funding disappeared and along with it the possibility to make the film. Gilmour says: “Returning to Australia to make alternative plans would’ve been the sensible conclusion to our adventure. Instead, we went with Plan B and decided to shoot the whole film ourselves in Afghanistan.” With a camera bought at a Pakistani shopping mall, Gilmour shot the hastily rewritten film himself, while frequently in danger of kidnapping or worse. The result is a sensitive and compassionate tale on the impact of war and the cost of redemption. 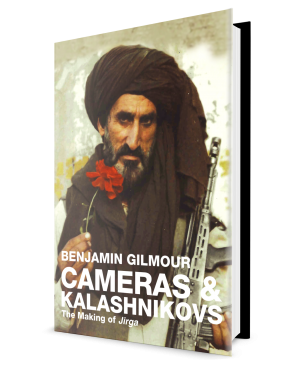 In anticipation of the release of my next feature film ‘Jirga’ this year, I have put together a book of behind-the-scenes stories and photography from our shoot in Afghanistan. It tells the tale of how Aussie actor Sam Smith and myself teamed up with a motley crew of Afghans and made this film on a shoestring budget in a place many people refer to as a ‘war zone’. You can also follow news of the ‘Jirga’ film release here. As a teaser for what is to come, here is an extract from the introduction of the book ‘Jirga – Guerrilla Filmmaking in Afghanistan’. To get you all excited for the film, I’ll be releasing several extracts from the book on this website prior to the it’s publication in June. My journeys as a writer and filmmaker have taken me to many fascinating corners of this earth, but none more compelling than Afghanistan. For all the beauty of it’s nature and people, much destruction and suffering has been afflicted on this nation by war. On the streets of Kabul I’ve shared tea with men my age who’ve never seen their country at peace. Previously I’ve spent considerable time among Afghan refugees over the border in Pakistan. I’ve dined with hardened militants on R&R from the fight against coalition forces in Afghanistan, been offered American military medals looted from army convoys in the Khyber, and narrowly escaped suicide bombings. Meanwhile, as a paramedic and aid worker I’ve treated the casualties of this conflict too, both war-wounded in frontier hospitals and returned soldiers in my home town suffering physical and mental injuries. My exposure to this war, or at least the impact of it on the humans involved, has provided me an insight into a conflict that never needed to last so long and perhaps never needed to have happened in the first place. I believe more than ever that war is a profoundly immoral undertaking and, in most cases, completely unnecessary, enormously damaging to humanity and the environment. Now, in Afghanistan, fighting drags on, driven by the interests of war profiteers and disaster capitalists, along with the power-plays of neighbouring nations. Civilians trying to survive in their ravaged land are not the only ones who believe the war is unjust. Many disillusioned soldiers have come to share that view. Last year I flew to Afghanistan with actor Sam Smith to make the feature drama film ‘Jirga’, the fictional story of one such disillusioned soldier, Mike Wheeler. Mike quit the Australian Army soon after returning from his second deployment, tormented by an incident that took place during a joint US/Australian raid on a village in Kandahar. In the heat of battle Mike accidentally shot dead an unarmed man who appeared in a doorway. Our film tells the tale of Mike’s return to Afghanistan as a tourist hoping to track down the family of the civilian, beg forgiveness from them and offer compensation. His journey is a moral one and judging by the disregard he has for his own welfare it appears he will stop at nothing to complete his mission. Along the way he meets several generous Afghans, including a group of surly Taliban, willing to help him reach his noble goal. As he gets closer to the village where the raid took place Mike discovers the hard way that forgiveness cannot be bought. My hope is that our film will give a voice to Afghans and offer greater insight into a conflict many struggle to make sense of. Mike’s courageous journey into his nightmare, aided by ordinary Afghans, helps us to better understand and empathise with both civilians and combatants. The film also aims to inform our perspectives of Muslims in an age where politicians and mainstream media persist on blaming terrorist acts on Islam itself. Jirga demonstrate the mercy among those who adhere to this faith, a mercy commonly ignored by extremists and Islamophobes alike. Even for seasoned travelers, arriving in central Nairobi, Kenya, during afternoon rush hour is a hectic experience. Local ‘matador’ buses spew exhaust, revving their engines as if picking a fight with the snaking queues waiting to board. The traffic is packed so tight even motorbikes are jammed. How do ambulances get around in this city? I don’t have to wonder long. Within a few days I’m on one. Stellah Sakina, EMT with St John Kenya, gets out of her ambulance and moves deftly between stuck vehicles, asking drivers to move just a little more left, another to take some vacant space against a gutter. We can squeeze ahead, bit by bit, a fraction closer to our call. Slowly we follow behind Stellah as she walks through evening traffic, lane splitting on foot to guide us through. Much as I’d have welcomed the opportunity to work with pre-hospital services in an African mega-city, my mission as a Trek Medics’ delegate to East Africa is clear: work with the Kenyan national EMS provider St John Ambulance on a first responder pilot program in two rural counties: Machokos and Tana River counties. The team is made up of Lotern Brown, St John project manager, and Malachi Omolo, IT support. But before we head into the wilderness, I’m given an official invitation to the St John annual parade. It’s as much the spectacle it was expected to be, all brass bands and impressive marching tricks and even a simulated childbirth responded to by St John ‘Badgers’, first aiders no older than eight.